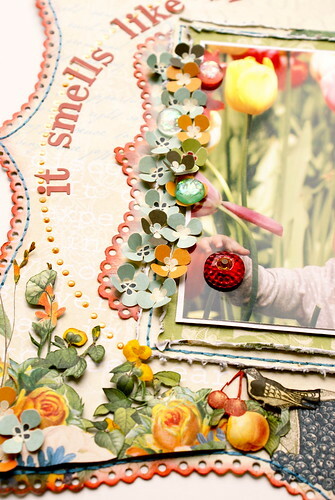 See Julie Scrap: Webster's Pages March Challenges and a SALE!!! First off......I can't believe it but......WEBSTER'S PAGES IS HAVING A SALE!!! And I wanted to share the March Challenges this month. For the Digital/Hybrid Challenge, I am hosting!! March generally means Spring to most and what a great time for Websters Pages to release their newest lines!!! Did you know that all of the collections are available in Digital format? Yes they are! And not only that, all of the newest lines are already available in the digital format, so digital and hybrid scrappers you are all set! 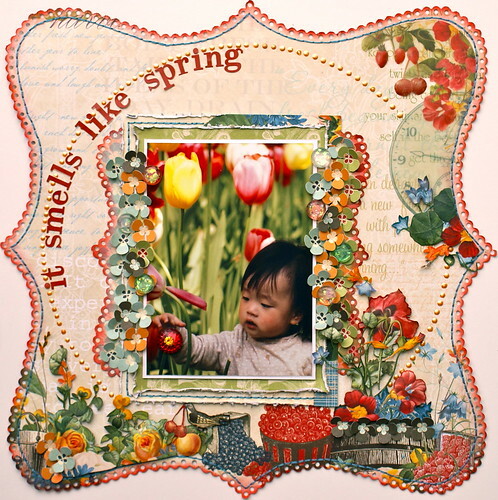 For this month's challenge I am going to work with the new collection Spring Market. I just love the colors in this collection...and the graphics are great too!! 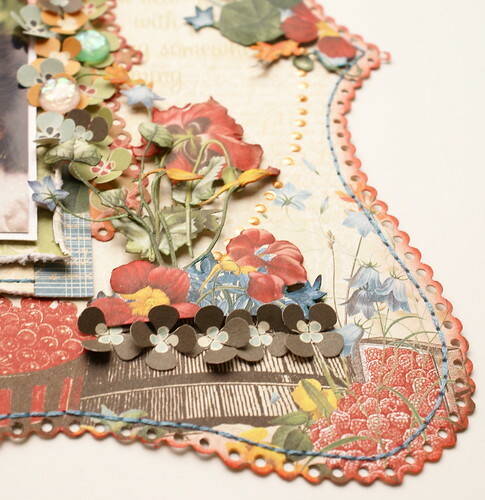 And with another layout I did as a lift of our GDT this month, Sarah Mullinax, I cut circles from the papers and stitched around them, I cut graphics out of a sheet of paper as well...along with lots of little strips of paper that are layered and layered! So my challenge to you digital and hybrid scrappers is to "CUT THAT PAPER"!!! And the good thing about doing it digital is that you can undo it.....so no mistakes to worry about!! Please mark your file with Digital/Hybrid Challenge March, and link it to this post. All files must be uploaded in the InspireMe gallery by March 31, 2011 for a chance to win a Gift Certificate to the Websters Pages Digi Shop! Hello from The Netherlands... Gerry`s here wishing you Happy 1st of March! Another month and another awesome challenge here at Inspire Me! And all you have to do is to create your own shaped layout with your favorite Webster`s Pages beautiful pattern papers. One of my favorite Webster`s pages products are the Sparklers and I added some of them to my project. The red sparkler you see on the photo was originally white but I used Copic Markers to color it in. 1. The majority of your project must contain Webster`s Pages products. 2. The project must have a shaped background. 3. You must post your project in the gallery under the file name "March Challenge - (title of your project)" and post a link in this thread. 4. The challenge will be open from March 1st to March 31st, 12 midnight PST. Prize will be winner`s choice of Webster`s Pages Paper Collection! All I can say is...Let`s get started! I hope you`ll join me in the fun! I look forward to seeing all of your beautifully shaped layouts! so loved the new blog look!!! very you. you have to teach me how to put the background.